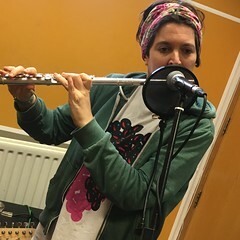 Part 2 of deXter Bentley’s Pay-As-You-Go Hello GoodBye Show Resonance FM fundraiser was broadcast live between 11.30am-1.30pm on Saturday 18th February in Central London and featured live performances from Efa Supertramp, Hendrik Huthoff and Sleaze. Troels Skov Nielson – Hvor? Trent Miller – How Soon Is Never? This entry was posted in dexter bentley, hello goodbye show, Hello GoodBye: Playlists, resonance fm and tagged dexter bentley, efa supertramp, fundraiser, hello goodbye show, hendrik huthoff, pay as you go, resonance fm, sleaze. Bookmark the permalink.